So I know the title of this post is slightly strange, but my mentality behind it is that you don’t really know if you’re starting out on the right foot until the entire experience is over. So by me saying a “good” foot, I know that in the moment it is good for me. I guess I will have to wait to find out if I’ve started off 2015 on the “right” foot or not. Okay, enough weird analysis. Let’s begin the post! I spent the day watching movies in bed and it was glorious. Judge all you want, but I needed a little “me time” after being in constant “host mode” for a week. It was nice to relax. I watched the entire “Back to the Future” trilogy (well, I watched part 1 the night before) for the first time! How had I gone my whole life without doing this? I’m disappointed in myself for not attempting this earlier. It was great. I met up with Daniel for dinner at “Hanoi,” a Vietnamese restaurant I had been to once before that I hadn’t particularly enjoyed. But I decided to give it another chance and order something different: a bahn mi. It was great! I could’ve easily eaten a second one, but restrained myself from ordering another. It was really delicious. Afterwards, we headed to “Tamara,” our favorite frozen yogurt shop. I always love hanging out with Daniel because we NEVER run out of things to talk about. Seriously. We spent hours talking about random things, both about our life or general topics. I would have loved to continue talking, but we both had work the next morning and it began to pour rain. We left as soon as the downpour had ended (for the moment) and caught the bus. It started raining a few seconds after we boarded. So lucky! I headed home and off to bed. Today at work, my coordinators came to visit. They asked me what a typical work day was like for me, and I made sure to showcase all of the hard work I’m doing for the company. They definitely took note and seemed very impressed. They then had a talk with my boss, who told me she only had nice things to say about me. Aww. After work, we had a mandatory meeting regarding an upcoming trip we’re having in the Negev, or the South/desert. However depending on weather, it may be postponed. Personally I’m most worried about catching pneumonia from sleeping in a tent in the middle of the desert in the winter. I will keep you posted on that one. After, Amy and I headed to dinner at our favorite New York-esque bagel shop, “Tal’s Bagels.” As always, it was delicious, and Amy and had a nice time talking. When we left to go home, it started pouring rain! Luckily I was prepared for the weather, yet again. So glad I brought rain gear, even if it’s not the most fashionable. I received an email this morning that the trip to the Negev was postponed for 2 weeks, meaning I’m unable to attend. After thinking about it, I actually did want to go, but I’m MUCH more excited to spend time with my amazing parents! Plus, I already went on a very similar trip 7 years ago (wow, was it really that long ago??). Anyway, I think I’ll survive. My coordinators were very understanding about it, and seemed sorry I couldn’t go. That night, I headed to Erin’s house with Amy for a night of fun! We had some yummy snacks and talked for hours. 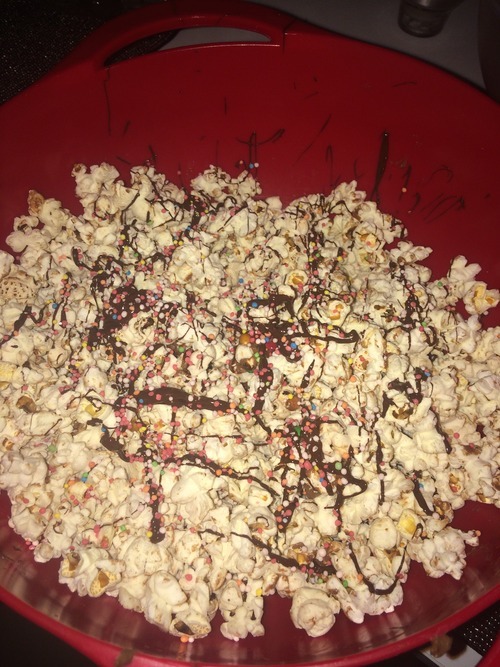 Erin even made us some epic popcorn, with chocolate, sprinkles, and M&M’s. After Amy left, Erin and I watched an episode of the show “Chopped” and provided hilarious commentary the entire way through. It was hilarious. I then headed back home and to bed.